Talk to your doctor about your treatment goals and preferences and work together to come up with a treatment plan that is right for you. Short-acting rescue medications can be used to treat acute asthma symptoms or for long-term control. 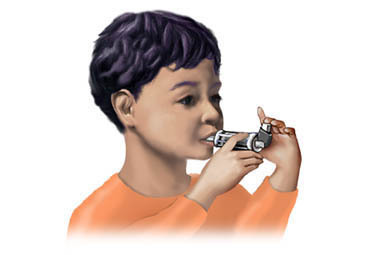 Children are more likely to benefit from inhaled medications if a spacer is used with metered-dose asthma inhalers . The University of Arizona offers a table that compares the different brands of spacers. A study, though, found that there was no difference in how medication was delivered with homemade versus store-bought spacers. Talk to your doctor to find out what is right for you or your child. These drugs are bronchodilators, meaning they open the airways by relaxing the muscles around bronchial tubes. This can provide quick relief of acute symptoms. They can also be used as preventive medications prior to exercise. You must be careful not to overuse these drugs and contact your doctor right away if your symptoms are not controlled with recommended doses. Ipratropium is a bronchodilator. This is a type of medication that opens up narrowed breathing passages and may decrease mucus secretion. Tiotropium, a closely related medication, has also been studied for use in patients with asthma. These medications are taken by inhalation to help control the symptoms of lung diseases. Ipratropium and tiotropium help decrease coughing, wheezing, shortness of breath, and troubled breathing by increasing the flow of air into the lungs. It is not usually used in children. When ipratropium inhalation is used to treat acute, severe attacks of asthma, it is usually used in combination with other bronchodilators. While these drugs are not commonly used to treat asthma except in the emergency room setting, there is some evidence that tiotropium can reduce the need for oral or inhaled corticosteroids in people with very severe and persistent asthma. These drugs are frequently used for a short duration to prevent the progression of moderate or severe symptoms, reverse inflammation, speed recovery, and reduce the risk of relapse. They are not truly rescue medications, but help prolong the effect of beta-2 agonist rescue. Magnesium sulfate may be helpful in treating adults with acute asthma. Long-term “control” medications are used to achieve and maintain long-term management of symptoms and reduce inflammation. These drugs suppress, control, and reverse inflammation. They can reduce the need for oral corticosteroids and rescue medication, and play a role in the long-term management of asthma. These drugs may be used for long-term prevention of symptoms. They modify inflammation and can be used as preventive treatment prior to exercise. These drugs provide long-term prevention of symptoms, especially nighttime symptoms and are often added to anti-inflammatory therapy such as inhaled corticosteroids. They may also be used as preventive treatment prior to exercise or contact with a known allergen. However, they should not be used during an acute attack. Long-acting inhalers, like salmeterol, may increase the risk of asthma-related death, intubation (putting a tube in the windpipe to breathe), and hospitalization. This is most likely to occur when they are mistakenly used as rescue inhalers. These medications are almost always prescribed together with an inhaled corticosteroid. Note : If you have any concerns, talk to your doctor. This type of drug provides long-term control and prevention of symptoms, especially nighttime symptoms. It works by opening the airways and relaxing the muscles around the bronchial tubes. It also increases the ability to clear mucus out of the airway. Leukotriene inhibitors are medications that decrease inflammation by preventing the action of leukotrienes, which sustain inflammation. These types of medications are not used to relieve acute symptoms, but can be used to prevent your symptoms from occurring. Leukotriene blockers are medications that decrease inflammation by stopping the production of leukotrienes. Used for long-term control and prevention in mild persistent asthma. This is an injected medication that binds to IgE, a type of antibody that contributes to allergic symptoms. These drugs provide long-term control and prevention of symptoms in mild, persistent asthma. These drugs help reduce inflammation and prevent escalation of symptoms. Oral corticosteroids can produce more side effects than inhaled corticosteroids. Long-term use of oral corticosteroids is not generally recommended. However, your doctor may prescribe oral corticosteroids for long durations only when other treatments have failed to restore normal lung function and the risks of uncontrolled asthma are greater than the side effects of the medication. To make dosing more convenient and prevent using the wrong inhaler, medications are frequently combined. These drugs provide long-term control and prevention of symptoms by combining the effects of a long-acting beta-2-agonist and inhaled steroid into one formulation. The side effects are similar to those described above for the individual medications. Do not share your prescription medication. Medications can be dangerous when mixed. Talk to your doctor or pharmacist if you are taking more than one medication, including over-the-counter products and supplements. Asthma treatment and management. American Academy of Allergy Asthma & Immunology website. Available at: http://www.aaaai.org/conditions-and-treatments/asthma. Accessed September 8, 2017. Cates CJ, Lasserson TJ, Jaeschke R. Regular treatment with formoterol and inhaled steroids for chronic asthma: serious adverse events. Cochrane Database Syst Rev. 2009;(2):CD006924. Park HW, Yang MS, Park CS, et al. Additive role of tiotropium in severe asthmatics and Arg16Gly in ADRB2 as a potential marker to predict response. Allergy. 2009;64(5):778-783. 2/24/2009 DynaMed Plus Systematic Literature Surveillance http://www.dynamed.com/topics/dmp~AN~T361091/Delivery-of-aerosol-asthma-medications-in-children : Rodriguez-Martinez C, Sossa M, Lozano J. Commercial versus home-made spacers in delivering bronchodilator therapy for acute therapy in children. Cochrane Database Syst Rev. 2009;(1):CD005536. 5/21/2010 DynaMed Plus Systematic Literature Surveillance http://www.dynamed.com/topics/dmp~AN~T114449/Asthma-in-adults-and-adolescents : Wilson SR, Strub P, Buist AS, et al. Shared treatment decision making improves adherence and outcomes in poorly controlled asthma. Am J Respir Crit Care Med. 2010;181(6):566-577. 10/8/2010 DynaMed Plus Systematic Literature Surveillance http://www.dynamed.com/topics/dmp~AN~T115858/Long-acting-beta-2-agonists-for-asthma : Ducharme F, Chroinin M, Greenstone I, Lasserson T. Addition of long-acting beta2-agonists to inhaled corticosteroids versus same dose inhaled corticosteroids for chronic asthma in adults and children. Cochrane Database Syst Rev. 2010;(5):CD005535. 6/9/2014 DynaMed Plus Systematic Literature Surveillance http://www.dynamed.com/topics/dmp~AN~T906120/Critical-asthma-syndrome : Shan Z, Rong Y, et al. Intravenous and nebulized magnesium sulfate for treating acute asthma in adults and children: a systematic review and meta-analysis. Respir Med. 2013;107(3):321-330.